4:48 - Incident in Turn 3 - the No. 21 and one of the Mazdas - one of the cars is stopped. Hopefully no yellow. 4:42 - Positions: P1 No. 45; P2 No. 62; P3 No. 90; P4 No. 87; P5 No. 18. No. 44 has moved into P7. 10 minutes left. Joerg is 33 seconds ahead of the No. 62. 4:33 pm - Joerg is now 31 seconds ahead of the No. 62 which is in second. 18 minutes left to go. Joerg and Jaime Melo in the No. 62 are running a similar pace. If there are no yellows, and nothing happens, the No. 62 cannot catch us before the end of the race. However, if there is a yellow, that would give the No. 62 an opportunity to close the gap. In the No. 44 Johannes is now P8. He is 11 seconds behind the No. 11 car and should catch them before the end of the race. 4:31 - Clean pit stop for the No. 45 - tires, fuel, no driver change. Joerg retains the lead. 4:30 - Positions: P1 No. 45; P2 No. 62; P3 No. 90; P4 No. 87; P5 No. 21. The No. 44 is P8. Joerg is 20 seconds ahead of the No. 62. We will pit again for tires and fuel. Risi will also need to pit - yes, they are in the pits, but are doing fuel only, no tires. They are taking a chance to double stint in the hopes of gaining time to close the gap to us. We will do tires. The No. 62 just received a penalty - + 18 in pit lane. That's a stop and go. Definitely some luck for us. We'll be able to do fuel and tires and get back out in front of them. 4:13 - Joerg radios in that he was being held up by a slow prototype. 4:10 - Positions: P1 No. 45; P2 No. 62; P3 No. 90; P 4 No. 87; P4 No. 21. Joerg has widened the gap a bit to the No. 62 and is 19 seconds ahead. 4:03 - Jaime Melo has now closed the gap to 15 seconds. If they continue at this pace, he could close the gap to Joerg before the end of the race. We have 47 minutes left to go. Cloud cover has moved in so we are having intermittent internet issues. When - if you lose radio connection, just reconnect the session. 4:00 - Johannes radios in that his drinking water is not plugged in, but we won't be able to do anything about it unless there is an unplanned stop. 3:55 - The No. 45 is by the Panoz now and he's back on the pace. the No. 92 BMW, which had been in fourth, is in the pits with an apparent problem, up on its jack stands. This moves the No. 87 into fourth. Positions: P1 No. 45; P2 No. 62; P3 No. 90; P4 No. 87; P4 No. 21. No. 44 P10. just under 1 hour left in the race. Joerg is 17 seconds ahead of the No. 62 Risi Ferrari which is in second. 3:51 - Joerg is behind the No. 21 Panoz on course, which is on a fast pace but is 2 laps down or so. Joerg's working to find a way to get by the No. 21. Joerg is plus 20 seconds to the No. 62 in second. Positions: P1 No. 45; P2 No. 62; P 3 No. 92; P4 No. 90; P5 No. 87. The No. 44 is P10. Joerg is stuck behind the Panoz and can't get by. Meanwhile, the No. 62 is running a very fast pace and is slowly closing the gap to Joerg. 3:47 - The No. 90 overtook the No. 62 to retake P3. But then was caught in traffic and went off course, luckily without impacting any other cars - spinning deep into the gravel -he was able to continue and has rejoined. The No. 62 is back in P2. Joerg still P1; Johannes P10. 3:45 - Positions: P1 No. 45; P2 No. 62; P3 No. 90; P4 No. 92; P4 No. 87. The No. 45 is 1 minute and 20 seconds ahead of the No. 62. The Panoz had spun on track and was attempting to restart as cars weaved around him - the No. 18 Vici car apparently hit him on track. 3:40 - No. 44 is in the pits. Tires, fuel, driver change to Johannes van Overbeek. The No. 44 is currently in tenth. 3:34 - No. 44 just got hit in the right front - he'll pit and they'll check out the car, driver change to Johannes van Overbeek, tires and fuel. Positions: P1 No. 45; P2 No. 90; P3 No. 62; P4 No. 92; P5 No. 21. No. 44 is P10. 3:20 - Green flag. 1.5 hours left to go. Joerg is still P1. The No. 45 should be good to go for the rest of the race. He now has a large gap to the next closest GT2 car, the No. 90. 3:17 - Joerg pits in the No. 45 for more fuel. Still yellow.Joerg was able to retain the lead. Positions: P1 No. 45; P2 No. 62; P3 No. 92; P4 No. 90; P4 No. 21; P5 No. 87. Most of the rest of the GT2 pack pitted at the end of that yellow. 3:12 - The No. 45 is in the pits. Fuel, tires, driver change to Joerg Bergmeister. the No. 45 was the first of the lead GT2 cars (those who have not already pitted) to pit. It was a short fuel, so Joerg may pit again under yellow for fuel. Joerg was out of the pits before the overall leader and retained the lead. 3:10 - Pits are open. The No. 45 will pit this lap. No. 44 will stay out. Still yellow. 3:07 - Still yellow, pits are closed, Thomas Blam notified us that the No. 45 will pit for fuel, tires and driver change to Joerg Bergmeister when the pits are open again. A bit earlier than we had planned. 3:05 pm - Seth reported in that tires are in the track. Course is yellow. Crew is getting ready - not sure if we will pit under this yellow or not. Looks like it was the No. 47 Orbit Racing Porsche which had the impact withthe tire wall, since we can see it sitting in pit lane and steaming. 3:02 - The No. 16 Mazda is slow on course - unclear what the issue is. 3:00 - We are getting close to our driver changes - under 20 minutes. Just under 2 hours left in the race. P1 No. 45; P2 No. 62; P3 No. 92; P4 No. 90; P 5 No. 21. Patrick in the No. 45 is six seconds ahead of the No. 62. The No. 16 Challenge car just went off track into the grass. 2:55 - The No. 40 appears to have exited the pits prematurely in their pit stop minus one wheel. the crew pushed them back and they have fixed the problem. Our radio broadcast is working now. 2:53 - Patrick radioed in that the tire wall has been pushed into the chicane. We may go yellow if they need to repair it. Looks like Wolf Henzler's belts may not be tight which would mean he would need to come in again to secure them. Patrick in the No. 45 still P1. Crews are getting ready in case course goes yellow. 2:41 - The Vici Porsche had a big off into the grass but continued. Patrick now has a 6 second gap ahead of the No. 62 wihch is in P2. The No. 87 Farnbacher Loles Porsche, which had fallen back several positions over the last few minutes, is in pit lane for driver change to Wolf Henzler. 2:49 - Radio is working now. To listen go to www.lizardms.com and click on the Follow the Race Tab. 2:46 - patrick has a nice gap now in front of the No. 62. Positions: P1 No. 45; P2 No. 62; P3 No. 92; P4 No. 40; P4 No. 90. No. 44 is P10. 2:40 - Patrick retains the lead. We are just over 30 minutes into the race. We are having some technical issues with our radio broadcast - we hope to have it fixed shortly. If you can't get on, try it again in a few minutes. 2:35 - the No. 90 went off and has fallen back to P7. Positions: P1 No. 45; P2 No. 62; P 3 No. 92; P4 No. 87; P5 No. 40. No. 44 is P10. 2:30 - Patrick passed the No. 62 to take the lead. Positions P1 No. 45; P2 No. 62; P3 No. 90; P4 No. 92; P5 No.87. No. 44 is P10. 2:23 on - The front four GT2 cars remain unchanged - P1 No. 62; P2 No. 45; P3 No. 90; P4 No. 92. All four are running nose to tail. The No. 62 and No. 45 are on a faster pace and build a gap between the BMWs, but then hit traffic and they bunch up again. Patrick is putting pressure on the No. 62 but has not been able to pass. 2:16 pm - Some incredible racing going on right now as Patrick attempts to pass the No. 62 while they are both passing slower cars and being passed by the overall leaders. Cars are three abreast in some of the turns. Patrick has not yet been able to pass the Ferrari. He is building a gap from the BMWs in P3 and P4, but that gap gets closed again everytime they hit traffic. 2:15 pm - The lead GT2 cars are coming up on the slower challenge cars already and will have to thread through them, while still avoiding the faster prototypes which will be passing them on the very narrow circuit. No. 45 P2; No. 62 P1. No 90 P3. No. 92 P4. No. 40 P5. No. 44 is P10. 2:11 am - No. 62 retains the lead, with Patrick in second, the No. 90 BMW in P3 and the No. 92 in P4. The four GT2 cars have built up a gap from the rest of the GT2 field. Patrick is working to stay close to the No. 62 and build a gap from the BMWs. 2:08 - Green flag. In the No. 45, Patrick held P2 on the start and he is close behind the No. 62 which was on the pole. The GT2 front pack is very tight together. Both BMWs are right behind Patrick. 2:06 - No start - not sure what happened but there was no green flag. 2:03- Cars are underway. 2 pace laps. 2:00 pm -Engine start - there are 2 pace laps before the green flag. We are starting 2nd and tenth in GT2. Patrick Long is starting in the No. 45 and Seth Neiman in the No. 44. 1:58 pm - National anthem is playing - just a few minutes until engine start. 1:30 pm ET - Good afternoon from Lime Rock Park. Pit lane is open and the cars are heading onto the track for their recon lap. Pit lane exit is open for only five minutes - cars must exit the pits and make their way to the grid. Once on the track for the recon lap, the cars will then grid for race start, or if there is an issue, they may return to the pits for repairs. Once the pit exit closes any cars not on the grid must start from pit lane. 10:15 - No. 44 pits for fuel, No. 45 for driver change to Joerg Bergmeister. Joerg will drive to the end of the session. 10:12 - Green flag. It is starting to warm up a bit but it's still pretty wet out there. 10:08 - A car is off - not sure if it's the No. 45 or another car. Red flag. No - it was the No. 40 which went off. No. 45 and No. 45 are both back in the pits waiting for the green. 10:05 - We should get started shortly. This is the final warmup session prior to the race, which starts at 2:05. Patrick Long is in the No. 45 and Seth Neiman in the No.44. We had torrential rain last night so everything is very, very wet. There is a lot of standing water on the track. Patrick just radioed in that there's a stream of water down the track - it's like ice. The session is twenty minutes. 9:50 am ET - Good morning from Lime Rock. Our morning warmup session is delayed this morning - we should get started about 10:15 or so. 4:00 - No. 45 is P2 and No. 44 P10 in GT2 Qualifying. No. 62 is on the pole. 3:51 - In the No. 62, Jaime Melo did a 54.665 - putting him in P1. There are four minutes left, but we will not go out again. The No. 87 is still out and there are four minutes left so someone could still beat Jamie's time. 3:49 - Patrick takes the lead! Just .025 seconds ahead of the No. 62. And Risi is out of the pits to try for a faster lap. We'll see if Risi can pull out a faster lap. Seth is P10 in the No. 44. Patrick will pit this lap. 3:47 - With a clear lap, patrick has moved up to P2. Risi No. 62 Ferrari, which is P1, is in th epits - waiting it out. Patrick has traffic this lap, so he has to wait until the next lap. he has one more lap to try for a flier. 3:45 - Ptarick is out again - he should have a good gap and be able to get a clear lap. 3:41 - In the No. 45, patrick switched positions again with the No. 62 and is now ahead of Jamie Melo on track. Jamie is P1 with a 54.744. Wolf is P2 witha 55. 026. Patrick on his fast lap hit traffic with the No. 18 Vici Porsche - that will definitely affect his time. The No. 92 went off again. He is P7. The No. 90 BMW is P3. The GT2 cars are now all bunched up on track which will be a problem for everyone. They are calling Patrick in to add fuel and try and get him a clean lap. 12 minutes left. Patrick is currently P8. No. 44 is P10. 3:38 - Patrick's first timed lap - he's P2, 2 second behind the No. 62 Risi Ferrari which is in the lead. On track, the Risi Ferrari is physically just behind Patrick. And again on the next lap, Jaime Melo in the No. 62 is even faster with a 54.777. The No. 87 was P2, but went off track just after his fast lap. he was able to continue. Patrick went briefly into the grass so let the No. 62 go by on track. 3:36 - The qualifying session is underway. Joerg Bergmeister is qualifying the No. 45. Seth Neiman is qualifying the No. 44. The session is 20 minutes. Unfortunately it looks like it is just about to rain. Hopefully we'll have a dry session - at least to start - we are going to go out immediately at the start of the session to make sure we get the most out of the time. 3:25 - Five minutes left in the session. Patrick is P2. He will pit this lap. The No. 92 went off again for the second time in the session - looks like he made impact with the tire wall but continued. Wolf Henzler in the No. 87 Farnbacher Loles Porsche is now P1. Seth will finish out the session in the No. 44. 3:21 - Patrick pits for one final change before qualifying. 9 minutes left in the sesion. 3:11 - Seth is pitting for a review with the engineers. Patrick is in the pits for a setup change. 17 minutes left. 3:05 pm - The No. 92 BMW is now P1 with a 55.024. Patrick P2 with a 55.256. 3:03 pm - No. 45 pits for a setup change. Patrick is still P1. 2:58 - Patrick Long is P1 in the session right now with a 55.256. 2:55 - Green flag. 35 minutes left in the session. 2:50 - Red flag to remove debris. 2:43 pm - Patrick Long is in the No. 45. Seth Neiman is now in the No. 44. 2:41` pm - Joerg is P2 in GT2 right now, Johannes is P4. Patrick Long is getting ready to get into the No. 45 and Seth Neiman into the No. 44. 2:30 pm ET - Green flag on the afternoon practice session. The No. 44 and No. 45 are in the pits and ready to go. Joerg Bergmeister is in the No. 45 and Johannes van Overbeek is in the No. 44. Qualifying begins immediately after the session. Patrick will qualify in the No. 45. 12:15 - Checkered flag on the first practice session of the day. We'll be back with you at 2:30 ET today for the second practice session and then qualifying immediately following. In the session, the No. 45 was P5 in the session, the No. 44 P9. 12:10 - Joerg is now P4 in the No. 45. He will pit next for a tire pressure change. In the No. 44, Johannes van Overbeek is getting in the car for his first stint. Five minutes left. 12:00 - Patrick's take on the session: "It's like a billiard table out there: smooth and no grip! Practice is tricky with the new addition of the GT3 cars. I like the challenge but it makes finding a clear lap very key at a track like this. it reminds me of being here last year in a prototype where just one out of six laps is relatively clear. The purpose for this session is setup not lap times, but the one time when we do push for laps times in practice is to make a performance enahancement - sometimes what feels marginally better is marginally worse on the stop watch, so it becomes a push in that scenario." 11:49 - The No. 44 is back in the pits for tires. In the No. 45, Joerg is getting ready to get in the car in a few minutes. Patrick Long is still in the No. 45 and is P2. 11:39 - the no. 44 is back on course and the No. 45, after pitting, is also back on track. 11:36 - Well, the No. 45 accidentally went on track before it went green so Patrick received a black flag. He'll be back in the pits in a minute. the No. 44 is back in the pits - apparently the car ran out of gas on course. They will refuel and he will return to the track. 11:30 - the No. 44 has pulled off course with a problem. A prototype spun on course, red flag. the No. 44 is safely off course but will need to be towed back. Patrick is in the pits giving feedback to the engineers. 11:25 - Patrick is P3; Seth is P 9. Traffic is the big issue for drivers to deal with at Lime Rock - it's a very short and narrow circuit with very little passing room. 11:22 - Patrick Long is in the pits for fuel. He'll do five laps and then come in to give the engineers more information for setup. We have two practice sessions today before qualifying which starts at 3:35 pm ET. This is our first day on track so we have to hustle to get our setup together. The No. 44 crew is working to shakedown the No. 44 which was retubbed after the accident at Le Mans in June (the No. 80). 11:15 am - Green flag. Patrick Long is in the No. 45 and Seth Neiman is in the No. 44. 10:30 am ET - Good morning from beautiful Lime Rock, CT. The cars are warming up in the garage in prep for the first sesion of the weekend which starts at 11:15 am ET. 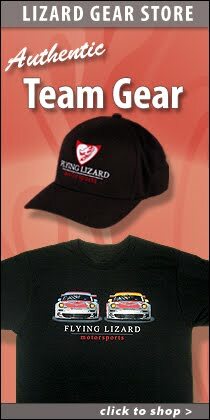 * We've started a twitter feed - follow @FlyingLizard_MS and will feed some blog content to it. We'll be testing it this weekend. * TV broadcast is on Speed, live, starting at 2;00 pm ET on Saturday.